We’d love your help. 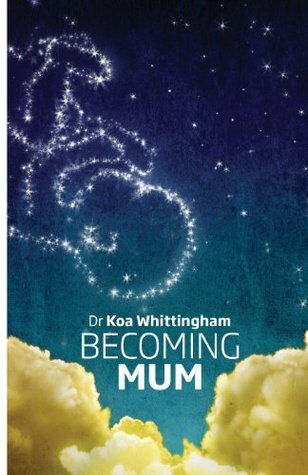 Let us know what’s wrong with this preview of Becoming Mum by Koa Lou Whittingham. To ask other readers questions about Becoming Mum, please sign up. In Becoming Mum, Dr. Koa Whittingham encourages readers to engage in interactive exercises that explore and vitalize the psychological passage into motherhood. This book, which is based on the principles of mindfulness-based cognitive behavioral therapy and acceptance and commitment therapy, is primarily intended for women who are in efforts to conceive, who are pregnant, or who are parenting infants. Dr. Whittingham notes that the book is meant to be flexible, though, so it could apply (at leas In Becoming Mum, Dr. Koa Whittingham encourages readers to engage in interactive exercises that explore and vitalize the psychological passage into motherhood. This book, which is based on the principles of mindfulness-based cognitive behavioral therapy and acceptance and commitment therapy, is primarily intended for women who are in efforts to conceive, who are pregnant, or who are parenting infants. Dr. Whittingham notes that the book is meant to be flexible, though, so it could apply (at least to some degree) to partners of these women, parents of older children, women who are planning for a potential pregnancy, fostering, or adoption, and women who have recently lost a child due to miscarriage or stillbirth. In fact, although none of these situations are covered in detail – or in large amount – several of these topics, along with step-parenting, are mentioned in the book. The book is organized by cognitive and emotional processes that may arise as related to the transition to parenting. These topics include a number of how to’s: preparing for and distancing yourself from unwanted advice about parenting, being more self-compassionate when doubt about your parenting choices arise, working through relationship changes with your partner, and making values-based choices about family matters. As a woman in this age range who sees many female clients in this age range, I can confidently state that most, if not all, young and middle age women deal with these topics, whether or not they have children of their own. There is societal pressure to want children (plural), to have them biologically and naturally, to report that pregnancy is a wonderful experience, and that parenting is joyful all the time. Choosing not to have at least two children, or saying that you had an unplanned or difficult pregnancy (and so on) is still often consider taboo! I think this book has a wide appeal. Dr. Whittingham does an excellent job of normalizing all such topics in Becoming Mum. Each chapter is organized into four parts. The first section introduces the reader to the overall ideas being introduced and provides exercises and strategies. There is space for writing down personal ideas as relevant to practice familiarity with identification of parenting values, acceptance of difficult emotions, mindfulness, and the like. The second section introduces a specific example to show readers how these topics might apply to someone in real life, and the third part of each chapter takes that idea a bit further by showing how the topics might relate to specific situations such as grief and loss, or anxiety. The final part of the chapter gives suggestions for activities and exercises that directly relate these topics to the readers’ daily lives. This chapter structure allows for readers to easily see how overall concepts might fit in with concerns they have or might have in the future as they reach different stages in the transition to parenting. This book reminds me a good deal of the joy of parenting by Lisa Coyne and myself, which I think is a good thing. What is unique about it is that it really focuses on the transition to being a mother. Also, it’s direct approach to how topics are relevant to specific issues that might arise given certain circumstances (e.g., postpartum depression, morning sickness) make it novel. I highly recommend it. Best "pregnancy" book I have read - cognitive behavioural therapy techniques specifically aimed at women with histories of anxiety and depression who are planning to/about to become/already are mothers. Absolutely what I needed to read right now, and will definitely be buying this for all my pregnant friends in future. Beautiful book for preparing mother's for the challenge of parenting.It is like a walk through journal. Gives clarity on bringing out questions on values that you wish to instill in your future offspring. *I received the book for free through Goodreads First Reads. An Awesome, helpful and inspiring read. I am a research fellow at the University of Queensland, a clinical and developmental psychologist and a mother. Parenting is one of my key research areas. I live in Brisbane, Australia, with my husband and daughter. I have always loved both writing and reading. I first had the idea of writing becoming mum www.becomingmum.com.au while trying to conceive. Given what a monumental change it is to beco I am a research fellow at the University of Queensland, a clinical and developmental psychologist and a mother. Parenting is one of my key research areas. I live in Brisbane, Australia, with my husband and daughter. I have always loved both writing and reading. I first had the idea of writing becoming mum www.becomingmum.com.au while trying to conceive. Given what a monumental change it is to become a mother, I wondered why a book offering women psychological support during the transition did not already exist. I quickly realised that, as a parenting researcher and a clinical and developmental psychologist, I was the right person to write such a book. The idea grew along with my pregnancy and I began writing in earnest during my maternity leave. Most of the content of becoming mum was literally written on a laptop propped up on my knees while my beloved baby slept across my chest. I think this makes Becoming Mum genuine and sincere. I am passionate about giving mothers psychological support and I am passionate about the psychological support being nonjudgmental, empowering and liberating—support that is grounded in each woman’s values and easily adaptable to each woman’s circumstances. My aim in writing becoming mum is to support each mother in becoming the mum they want to be.